Recently I've been really into acquiring natural, organic, and cruelty-free skincare, as it's been something that I've been meaning to do for a long time but hadn't put out the effort into implementing. As I kept on researching brands and products, the term 'Ayurveda' kept on popping up and it really interested me to find out what exactly it was. Ayurveda (transl. from Sanskrit, 'knowledge of life') is a thousands year old Vedic Indian holistic system of healing that focuses on treating not only remedies for the body but also for the mind and spirit. Ayurveda believes there are three basic energy characteristics (doshas) found in every person (Vata, Pitta, and Kapha), each one with physical and emotional/mental attributes, but one or two dominates the others. Disturbances of these doshas (external and internal forces) enact the usage of Ayurvedic treatments, the outcome hoping to bring energy back into stability. What's essentially important in this is that it differs substantially to the Western outlook on treatments, as Ayurveda takes in specifically an individual's unique circumstance (based upon the doshas) while looking at both medical and psychological history. There are mass amounts of research cases and studies done on Ayurveda and its connection to Western medicine and science. Some research specifically shows its validity in science, connects it to specific genes and physiological patterns, and has uncovered substantial findings of doshas' important link in regulatory systems. Ayurveda is a multiple layered holistic system that aims for the most accurate treatments and disease prevention (ranging from dietary changes, aromatherapy, yoga, meditation, etc), especially when it comes to using natural herbs and vitamins that are full of antioxidants. It's essentially part of a wider picture by being involved in socio-cultural elements within a traditional and religious environment, and is often used in home remedial cases. In regards to skincare, Ayurveda's cosmeceutical usage of natural herbal spices, botanicals, and minerals date back to the Indus Valley Civilization. 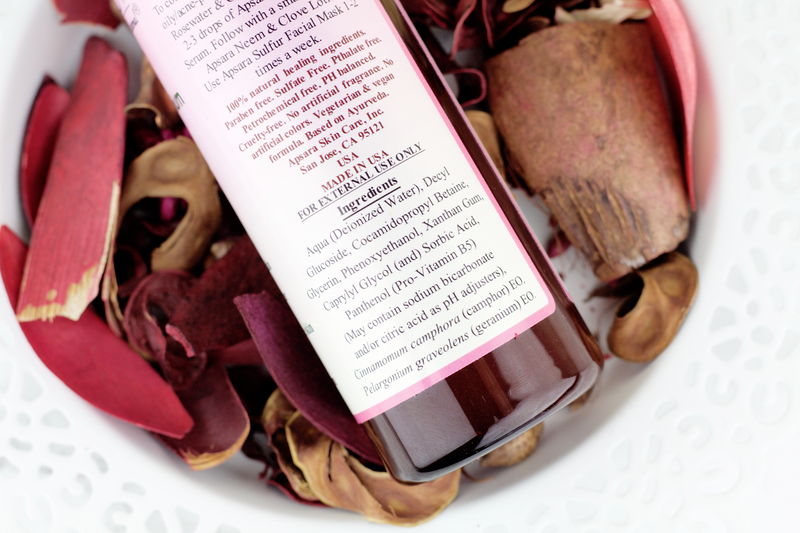 Western culture has caught onto this anti-aging and antioxidant rich treatment treasure that's been used for so many years, and one can easily see the influence by the numerous powder cleanser products available on the green beauty market. Although Western powder cleanser products do stray away from traditional Ayurvedic ingredients by using harsher mixes (often 'extras' such as vitamin c, sodium bicarbonate, etc), the main core inclusions of clays, turmeric, essential oils, and other skin nourishing items are still there. Ayurvedic skincare is made up of numerous product varieties and uncountable ingredient mixes, all with their own individual target treatments. 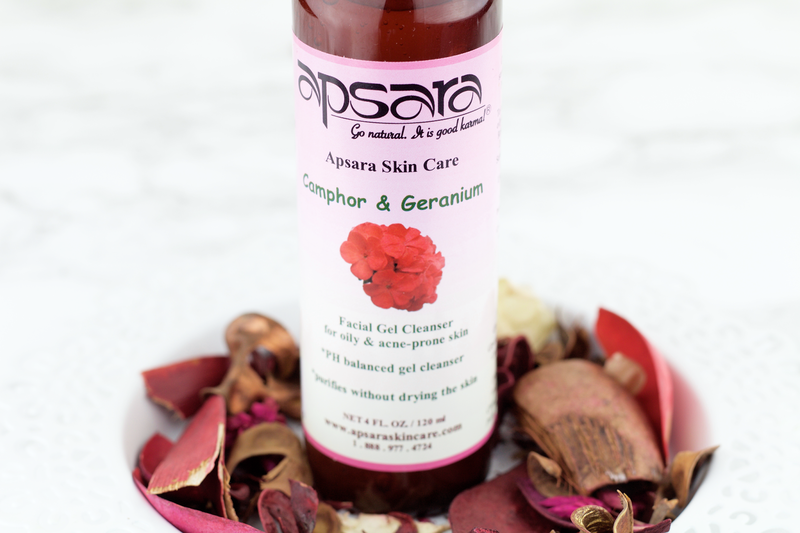 Taking all of this information into account, I was more than ecstatic when Apsara Skincare contacted me about trying out their Camphor and Geranium Facial Gel Cleanser* and talking about it on my blog. Founder Sheetal Rawal, a scientist with a background in molecular biology/human genetics, established Apsara (transl. 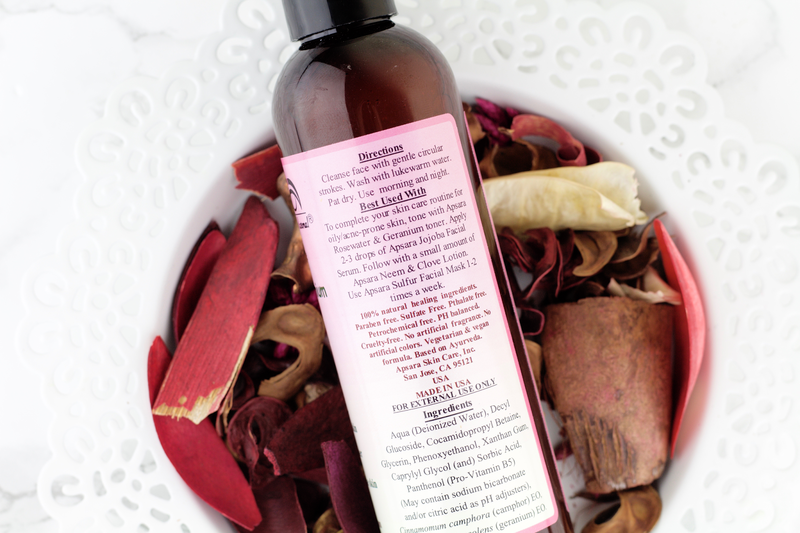 from Sanskrit, '(celestial) nymph') to create natural and cruelty-free skincare products inspired by Ayurvedic principles to get healthy, glowing skin. Rawal from a young age had always been interested in taking care of her skin and often found herself in the kitchen making all sorts of concoctions with much trial and error. After changing her whole lifestyle for a more green one (including becoming a vegetarian), she set to work to create Apsara Skincare and used her scientific background to help her with chemistry formulations. Rawal believes that "beauty and grace is inherent in all of us," with nature's abundance of herbs and botanicals easily accessible to use and help get our skin to the best possible state that it can be. 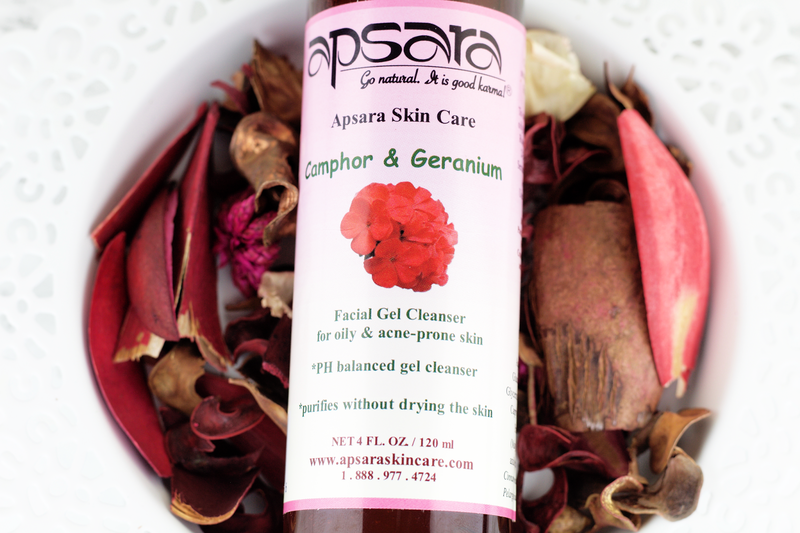 Apsara Skincare is for the consumer wanting natural ingredients in effective, low cost products without the need of using harmful chemicals or synthetics. It is made without animal ingredients (nor are they tested on animals), no parabens or sulfates, fragrance free, made in small batches under concentrated supervision, and over 70% of products are made without synthetic preservatives. They have a user-friendly interface that allows you to get help with choosing products based upon your skin type and the kind of product you want, along with including options for men and baby/kids. 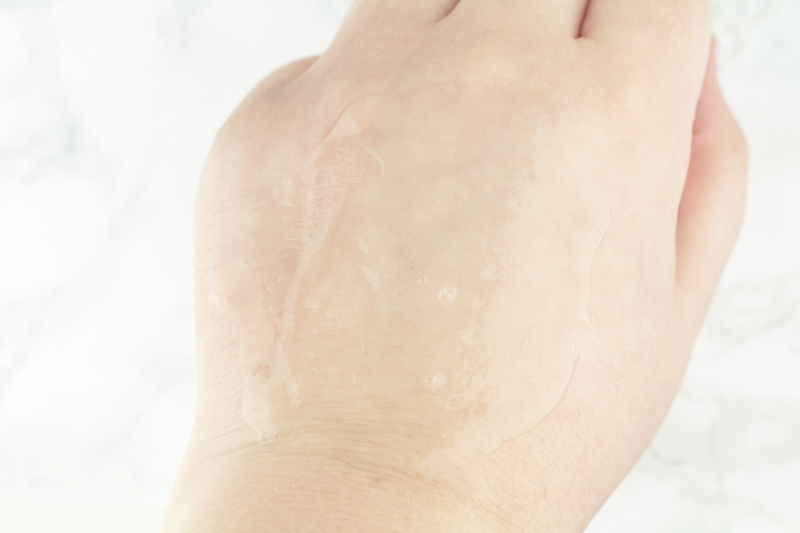 Made specifically for oily and acne-prone skin in mind, this mild gel cleanser deeply cleans out the pores and skin impurities to create an even base without stripping away the skin's natural moisture. Two of the main ingredients are essential oils camphor and geranium, and both are very effective at treating and helping troubled skin. The camphor included in this product is taken from Cinnamomum Camphora/Camphor Tree, a large evergreen tree native to Asia, and is extracted from the leaves through steam distillation (traditionally also by the wood). By that extraction, three fractions are created: white, yellow, and brown. White camphor essential oil is the only one that is safely used since it does not include safrole, which is toxic and carcinogenic. Camphor essential oil is used for a variety of treatments, from being antiseptic, anti-inflammatory, and great for acne-prone skin. It should be heavily diluted and mixed with other oils (such as frankincense, lavender, eucalyptus, etc). It's important to understand that camphor EO should be included in an essential oil mix at a small quantity (less than 1%), and in this product it is second to last on the ingredient list. However, you still are getting some of the great qualities that camphor essential oil does for the skin as it works effectively in small quantities. It has a pungent, woody aroma. 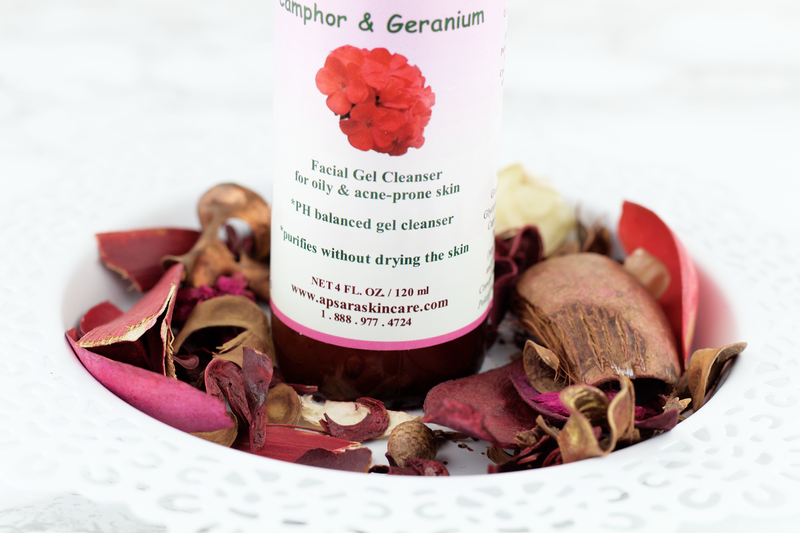 The geranium included in this comes from Pelargonium Graveolens/Rose Geranium, a type of floral from the Pelargonium genus that is native to South Africa, and only one of the few of its species to be used as an essential oil. It is produced via steam distillation from Rose Geranium's flowers and leaves, and is used topically to promote the appearance of healthy skin. It has a sweet aromatic mix of rose and citrus, and is widely appreciated in aromatherapeutic usage as a very calming and mood uplifting oil. Rose geranium works wonderfully mixed with other essential oils such as lavender or jasmine. It works for all skin types but especially well for those with oily, clogged pores. Rose geranium essential oil is a natural antimicrobial, antifungal, anti-inflammatory, antiseptic, hydrating, and oil balancing product. I've been using this cleanser since mid-August and I've been really impressed at how well it's done at clearing up my skin and helping some little bits of PIH I have on my right jaw (my most troublesome spot). The PIH did not really change until the 3rd week and by that time my acne had cleared up a good amount, which was great to see since my skin can be quite stubborn when I'm under so much stress. You already know that my skin is very oily and because of that I have an arsenal of products to help me balance out that oiliness. Using this cleanser by Apsara has been like a dream, one in which I would look forward to after inhaling its herbal scent and quickly rush to throw it onto my face (literally rush). 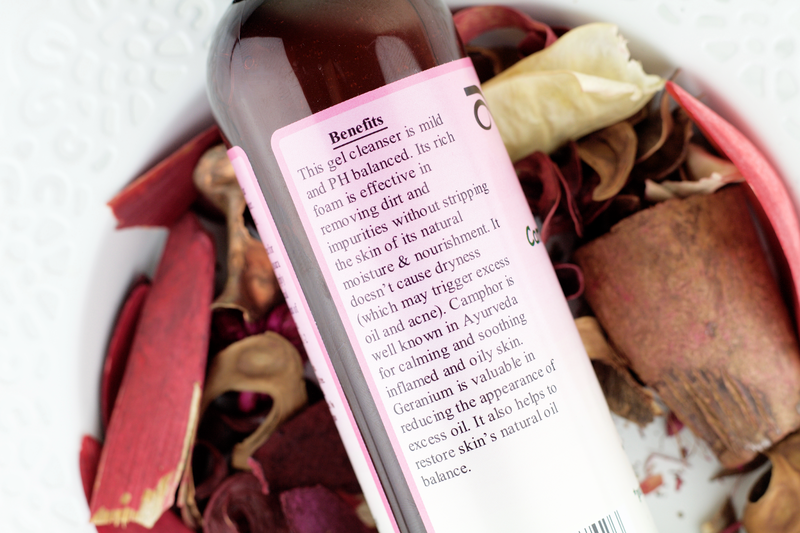 I prefer to use this in my second cleansing step, since I want to get the most out of the camphor and geranium ingredients (and also at the beginning of using this, I wanted to see how it did with my skin as I consistently used it). I especially liked to use this cleanser at night, as its cooling sensation and aroma really would help after a long humid day. You might be interested to read that they are at the bottom of the ingredient list, and it's because essential oils (especially in a mixture) need to be at a certain diluted percentage due to them being so strongly concentrated. It doesn't lessen their ability to work well or to absorb less of any of their great skin benefits. 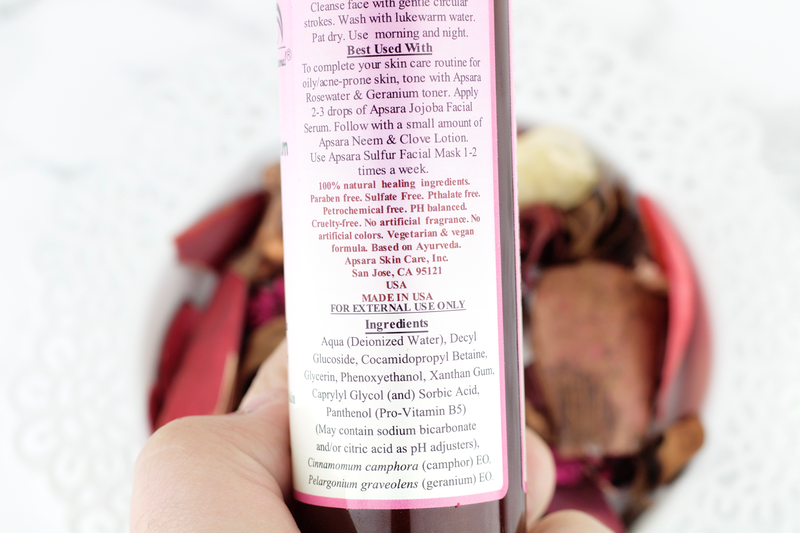 I'm really impressed with Apsara Skincare as a brand and I know I'll be on the lookout for more products to try once I get through some others I currently have in rotation! Ayurvedic skincare is also something I'd like to look more into, so if you are a fan of any products or brands I'd love to know what you really love! Apsara Skincare has partnered with me to host a giveaway on my instagram! Be sure to enter (it's REALLY easy!) as you can win one of their cleansers of your choosing! There are four cleansers all based on different skin types. It is an international giveaway so anybody can enter! Good luck! *This product has been kindly PR gifted from Apsara Skincare. See my disclaimer for more information.